We return from our family trip tired and a bit annoyed that work is still a thing! But we will not allow that to distract us from the most important thing in life: telling folks about local news stuff! We want to draw your attention to a new category! “Kids” will include any events that specifically discuss how the people there should be kids or that strongly imply that it would be super weird for a 30-something to roll up and check things out. A lot of places still don’t really give us any detailed description that we can use to make inferences, so this might be a bit wonky, but we figure it’s a good way to gather up a lot of the events that pretty much only parents will be interested in finding! Also this isn’t strictly local but we’ve been having fun with Pokemon Go, a game that is by all accounts just a real mess, but still allows us to occasionally catch a Snorlax at work so it’s pretty easy to forgive those sins. If you signed the surprisingly comprehensive EULA that basically says Niantic own your soul, you may want to follow these instructions to opt out of the arbitration clause! Also don’t allow it to implant more than 4 eggs. Don’t forget you can support us and control us on Patreon! Exert your terrible will upon our pitiful form! Head down to the museum to enjoy an artwalk! A one-night only art exhibit by Lana Fiala, an open mic, and featured readers Jonathan Wright and Joshua Michael Stuart! Summer Family Entertainment: Dorothy Cresswell, Sing-tastic Songs! One of the founders of the Healing Circle singers, and a co-host of the Bridges Coffee House, will come sing for you and help you sing along! Nice songs for family folks to sing and generally be as wholesome as humanly possible! Make a really cool thing appear in the world out of nowhere! Feel the raw primal power that is creation! Reach into a star and mold it into a herald who will conquer all the fools who oppose you! Alternatively, cobble together a fun toy using interesting tools available at the library! Clix your heroes into place! This time try a team of nothing but heroes that a friend has said they’ve never heard of! What? Are you kidding us? You’ve never heard of Starbrand? Or Quasar? Do you even read comic books? Oh wait no you do not this makes a lot of sense now. A regular rendezvous of web designers, coders, and just generally the sort of folk who make things out of computer-y bits and then make them go onto websites. A great place to meet people with similar interests and goals, and learn something new! The third annual Palmer Public Library convention! There are snacks, games, and a cosplay contest! There’s also going to be a panel by Sarah Hodge-Wetherbe! It is possible this is the shortest convention ever? Liani Davidson of Broadfork Permaculture will present Garden Beds in Fall! Liani has over 12 years of experience in organic CSA farming, home-scale food production, and teaching permaculture design! She builds food gardens across Franklin and Hampshire counties along with her team at Broadfork Permaculture. We’ve heard a lot of people rave about Wolf Children! Maybe watch that? We have to admit our lack of experience with anime really makes it hard to recommend much. We’re sure the other folks in the club will have ideas though! PVGD: Two-Year Anniversary Cookout and Potluck on Sugarloaf! Burgers [VEGGIE AND BEEF] for … YOU? Yes! Join the great folks at PVGD for a cookout at the summit of Sugarloaf! Climb that cool tower! Meet new people and make new friends! RSVP on Meetup.com or Facebook at least 24 hours beforehand! 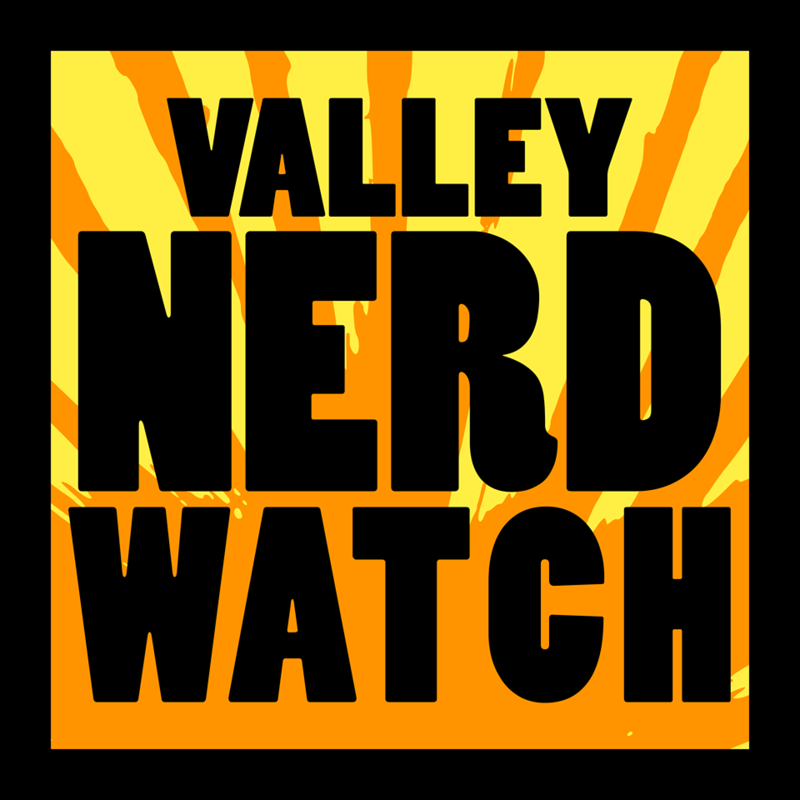 It’s a POTLUCK so bring a lot of money that you should then hand directly to the person wearing the Valley Nerd Watch shirt and shouting loudly “I need to have all that sweet cash”. We’ll be bringing some cookies! Note that driving up is $5 per vehicle, but hiking is free! Campers will make and decorate their own banner name! They will make a flag for each letter, and pledge undying allegiance to the house of our local Maester, the Great Eye of the West. When the time comes, campers will ride into battle with their hosts to protect the Maester from any and all attacks from the dreaded hordes of the Esterland Mauraders. Probably you’ll want to sign your kiddo up for some fencing lessons and maybe horseback riding after this one’s done. We know not who or what Dinoman! is, but we can assume a few things: he’s a man, and he is a dino. He’s possibly magic? Definitely some sort of science experiment, though. Dinoman has the power to inspire children to learn about dinosaurs we assume! It’s also possible that he just took the name Dinoman! and decided to teach kids about how to safely cross the street. Join the librarians and make a mess with paints, gooey things, and more! Paints count as gooey, most of the time. Gotta take issue with the implication they are not. The end of reading! For the summer, you should continue reading indefinitely after this party though. Reading is good. There will be music and storytelling which is like inefficient reading by Tim Van Egmond! Celebrate the release of the new book by watching the original movie! While you watch, snack on Butterbeer, pretzel “wands” and other magical snacks! If your child has a food allergy, let the librarians know and they’ll try to accommodate! Play an RPG with some friendly folks at Palmer Library! Act out the fantastic and experience the joy of blasting skellingtons to smithereens. It cannot be overestimated how fun that is! New players are welcome! There’s no site fee for new players or students of the Five Colleges! You’ll get to face off against strange changes in the world that seem to lure the fae at the same time as they throw nature into chaos! A fantastic LARP with more politicing than spell-casting, this is a great chance to get involved with an interesting game. Meet new friends and play Minecraft with other kids! Minecraft is like the Matrix but instead of being forced into it at birth, we’re all invited into it around the age of 8 or 9, and choose to stay because this blocky world offers us true, intoxicating power. MassDiGi Summer Innovation Program Open House! See four amazing new mobile games designed by 24 students from 15 different colleges and universities including Colosseum Coach, Comet Cats, Slime Break, and Takeover Trail! Register ahead of time, it’s free! NextEvent Alert! Wednesday Game Night In Easthampton!